In the old days, most people would find a decent person who lived in their village or neighbourhood, and after deciding they weren't a murderer, get married and have kids - all by the age of 22. Now we spend years of our lives searching for our perfect soul mate and, thanks to dating apps, mobile phones and social media, we have more romantic options than ever before in human history. Yet we also have to confront strange new dilemmas, such as what to think when someone is too busy to reply to a text but has time to post a photo of their breakfast on Instagram. And if we have so many more options, why aren't people any less frustrated? For years, American comedian Aziz Ansari has been aiming his comic insight at dating and relationships, and in Modern Romance, he teams up with award-winning sociologist Eric Klinenberg to investigate love in the age of technology. They enlisted some of the world's leading social scientists, conducted hundreds of interviews, analyzed the behavioural data, and researched dating cultures from Tokyo to Buenos Aires to New York City. 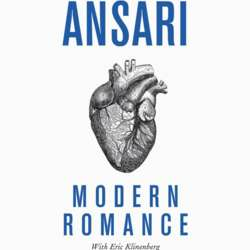 The result is an unforgettable picture of modern love, combining Ansari's irreverent humour with cutting-edge social science. Aziz Ansari is a stand-up comedian and an actor who has done four major stand-up tours. He starred as Tom Haverford on the Emmy-nominated comedy Parks and Recreation with Amy Poehler and other great people. Eric Klinenberg is a professor of sociology at NYU. He is the author of Going Solo: The Extraordinary Rise and Suprising Appeal of Living Alone and has contributed to the New Yorker, Rolling Stone, and This American Life. A good and funny book to read over the Chinese New Year Holidays. We expect an interesting discussion considering how ubiquitous social media has become around the world, and especially in China! We look forward to seeing you there! Please note: We have changed the time to 2:30 pm to give the movie club more time to screen their film immediately following our discussion. The venue is located not too far from the northwest exit of the line 10 Liangmaqiao subway station. Follow Xinyuan NanLu (south rd.) going towards town, until you get to the first intersection (Xinyuan Jie--Xinyuan rd. ), cross the road and go rt. Located in the corner building (Beijing Soho Residences) facing Xinyuan rd.